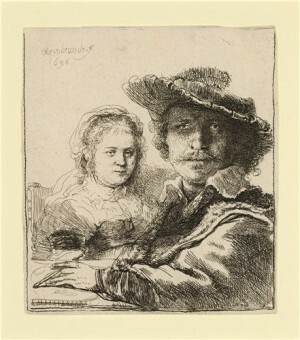 Rembrandt and his wife Saskia are shown in historical dress in this self portrait from the 1630s. Well known for making self-portraits throughout his life, this etching shows the artist during his most prosperous decade before the tragic death of his wife and 3 of his 4 children. The playful act of dressing up in their intimate domestic environment conveys the relaxed atmosphere brought about by financial security and marital happiness.